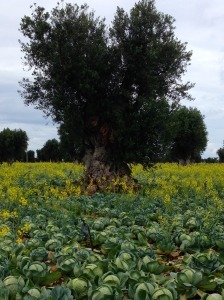 An ancient olive tree amidst a grove of fennel. For much of the past 25 years, when I heard someone mention Puglia, I could only think back to the music-filled and pasta heavy restaurant in Manhattan’s Little Italy, where I once threw my husband a memorable and ruckus birthday party before we were married. 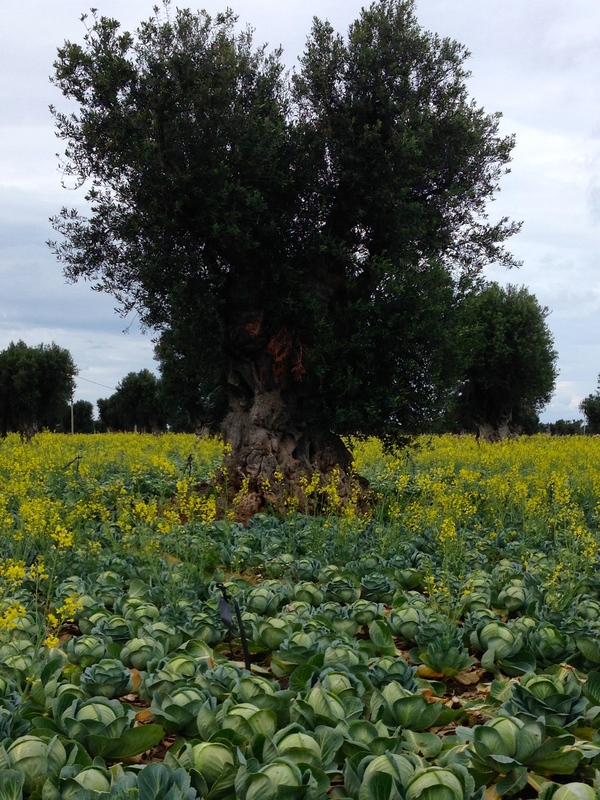 All that changed a few years ago when I met my friend Antonello Losito, founder of Southern Visions Travel, and heard him boast about the beauty and food of his native region, Puglia, situated in the heel of Italy’s boot. “You must come to Puglia to see for yourself”, he urged. He listed the reasons why, and I listened. I can now say firsthand that Puglia is a trip worth making. With only six days to explore, my husband, Rich, and I made the most of our time, splitting our six days between the Adriatic coastline area south of Bari and the historic city of Lecce further the south. 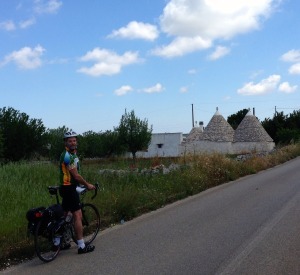 Cycling in Alberello, known for its cone-shaped Trulli houses. beyond my expectations. Setting out, I had no idea that we’d be biking amongst acres and acres of ancient olive trees, some as old as 2,000 years and still producing olives. The small country roads were perfect for taking it all in, the red poppies blooming and fennel bulbs popping up amidst the olive groves. A plate of crudo at Pesceria 2 Mari. wine. One Italian family and their young son finished their meal – their chairs quickly filled by several couples who had come to Puglia from Milan for a getaway weekend. Back on our bikes, we rode inland a few miles to our hotel, the Masseria Torre Coccaro. Beautifully appointed, the masseria (farm house) was once an olive farm, and was transformed into a charming, 39-room hotel. The highlight is not the rooms, which are simple and comfortable, but the manicured surroundings, restaurant and spa (Rich and I both had an olive oil massage which was pretty heavenly). The following day, we set out in our rented car with our bikes attached, for a 31-mile ride beginning in the town of Alberbello, known for its cone-shaped Trulli houses. Riding through more olives, vineyards and small country roads, we made our way through Locotarundo where we stopped at a creamery to snack on some cheese and cracker, and made our way to the town of Martina Franca. Although there were few people at the Osteria Piazzetta Garibaldi, we were treated like the locals that frequent the place and savored a vegetarian lunch of grilled eggplant, fava bean puree, escarole and grilled sweet pepper. 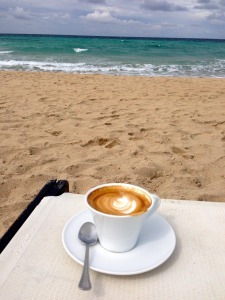 Finished with a macchiato and I was ready to complete the ride. 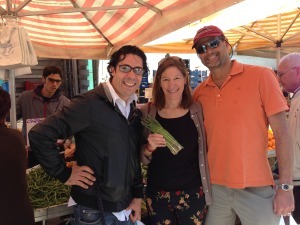 Buying produce at the market with Chef Tiziano. 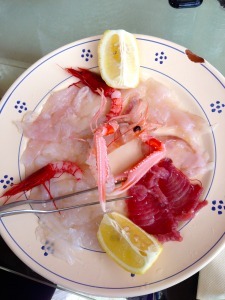 Food is a notable theme in Puglia. The creamy burrata. The burnt wheat pasta. The robust olive oil. The following morning we had a chance to hone our culinary skills firsthand with a local chef, Tiziano Mita. Caringly arranged by Southern Visions, we met Tiziano at the outdoor market in Monopoli, and helped him collect beautiful tomatoes, asparagus, fava beans, fresh garlic (not dried and 100 times more potent), and gorgeous strawberries. My favorite gelato flavors: cioccolato and caffe. about his mother and her preparation for the family’s Sunday meal, as we cooked in a kitchen owned by Southern Visions. Tiziano taught us how to turn pasta dough into macaroni which we rolled over a long metal rod, sear rabbit in oil, thyme and rosemary, create individual frittatas with pecorino, asparagus tips and topped with burrata foam. A visit to Puglia wouldn’t be complete without a visit to the old town of Ostuni, also known as the white town. Its white walls and cobblestone streets are the charm of this citadel built on top of a hill and surrounded by ancient walls. At an outdoor table at Taverna Gelosia, we dined on black rice with shrimp and curry and orecchiete – a local specialty – prepared with tuna, anchovies and black olives. We washed it all down with a local red wine made with Negroamaro grapes. 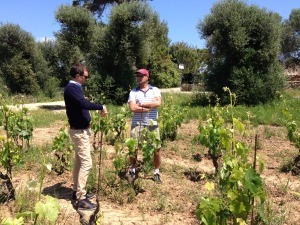 Touring the vineyard at Li Veli winery. the delicious olive oil we enjoyed with our crudo at the Pescheria 2 Mari. Three large bottles packed in a box, and off we went. Midway in our two-hour drive, we stopped off at a winery, Li Veli, a worthwhile stop arranged by Southern Visions. Alfredo, one of the young owners, gave us an in-depth tour of the winery and some of the surrounding vineyards, before sitting down to taste some of their wines – we were happy to learn that Li Veli exports to the U.S. so we can drink them at home too. A perfect way to end the day along the Adriatic coast. Roman Amphitheater in the middle of the central square. A two hour walking tour with SV guide, Silvia, exposed me to the city’s rich history, the character of the region, and some fascinating facts behind its architecture. 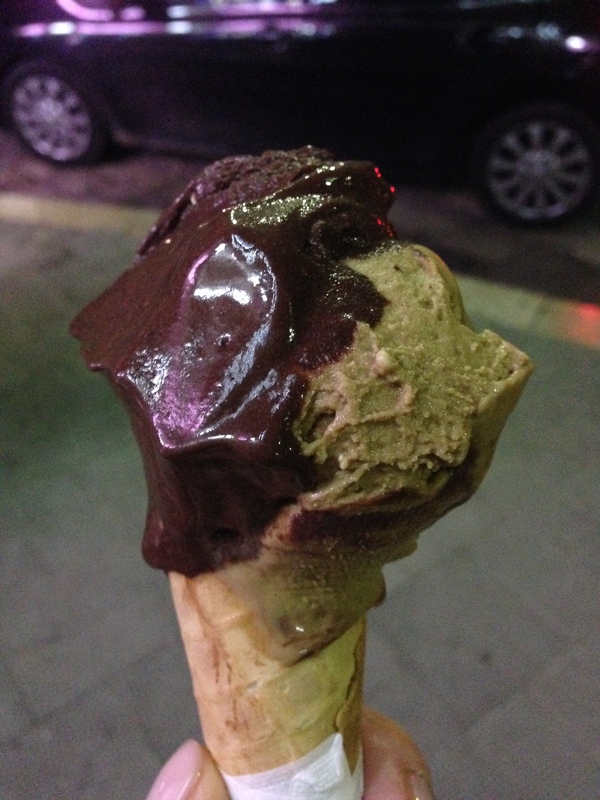 She told me about a few good restaurants, like La Torre de Merino and Le Zie, and numerous times during my stay in Lecce I visited the famous Natale gelateria where I spent little time worrying about calorie consumption. As we walked and talked about the people of Puglia, Silvia explained that in this particular region of Italy, there are very few psychologists. Coming from New York, this is a pretty startling comment. “People work and have stress,” she said, “but then they take care of themselves with siesta,” which I saw firsthand is a devout practice that continues with stores closing religiously from about 1:00 to 5:00 pm. “People eat and talk and take walks,” she went on, and are less stressed than those in other regions – swept up nowadays by faster-paced ways. I ate my gelato and followed the winding cobblestone streets back to the hotel, wondering when I’d make it back to Puglia.